Carole's Chatter: Crumbed Scallops with Sweet Chilli Mayo – I need to give these another go! Crumbed Scallops with Sweet Chilli Mayo – I need to give these another go! These crumbed scallops were tasty but the crumb didn't stick quite as I would have liked. Any suggestions for improvement are most welcome. I used a punnet of fresh scallops which had been prepared. But there was still the odd little brownish bit so I cleaned that all off – a bit fiddly but important in my opinion. I left the coral on (the orange bit) – we regard that as essential. I patted the scallops as dry as I could and then double dredged them in egg and panko breadcrumbs. 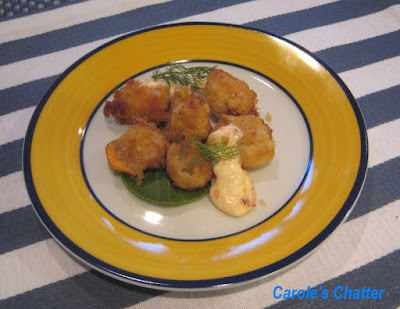 I shallow fried the scallops – if I had a deep frier that would probably have been better. They don't need much time in the pan at all – if you cook them more than about 2 to 3 minutes you risk getting little rubberised balls. I served it with a sweet chilli mayonnaise – some mayo with sweet chilli sauce, a smidgen of hot chilli jam and salt and pepper. I think a little lemon juice in it would have been good although I did have lemon wedges on the side.